What is all this hype about natural deodorant? Is aluminum in deodorant as bad as people claim? Does natural deodorant really work? These are all questions that I had prior to switching over from regular antiperspirant/deodorant to a natural brand. Yes, I switched for good and I am here to tell you why! As many of you have probably heard, antiperspirants (the deodorant that is supposed to control how much you sweat) contain aluminum. GASP. I know right?! It sounds so scary, and it sounds even scarier when your friends start gossiping about how you can, and WILL get breast cancer from applying an aluminum product on your armpits. The truth is, there is no actual conclusive evidence that this is actually the case. So if you decide to stick with your regular deodorant even after reading this post, I will not make you feel bad or warn you about cancer, although I feel obligated to let you know that if you have kidney disease you may want to consult with a physician before using an aluminum product, as your deodorant label will also ask you to do. SO I recently had a baby. When I was pregnant I became more conscious as to what I was putting in and on my body for fear of it absorbing into me and harming my baby (pretty unlikely in most cases, but I'm an anxious individual). I had heard the rumors about aluminum and immediately switched to the first natural deodorant I could grab off of the shelves at the supermarket. I figured I'd just have to deal with being the smelly kid on the block until after I had my little one and was all done breast feeding. As I did more research on Aluminum, I decided that even if I didn’t mind it on my own skin, I didn’t feel super comfortable about my little on ingesting it since it was so close to her face while she fed. 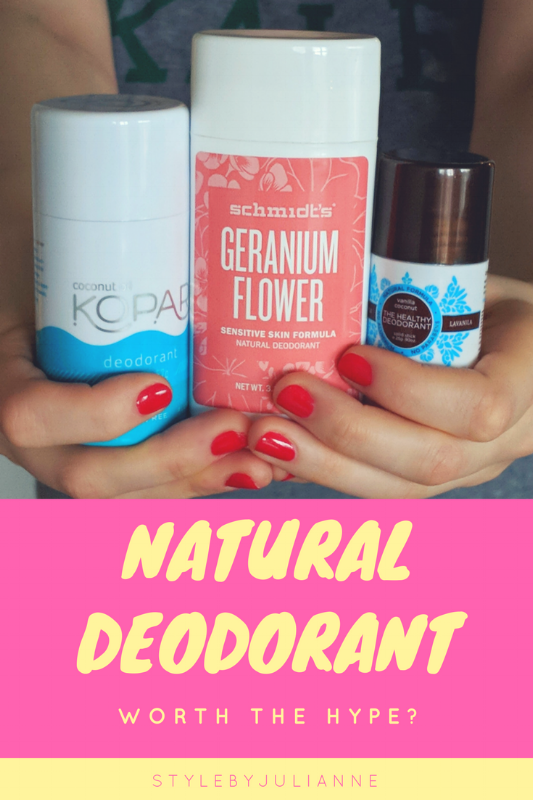 Making The Switch to Natural Deodorant! I began using natural deodorant, and as I used it more and more I began to realize, I really liked it! I went on the journey to find my favorite brand and scent and I tried a few along the way and thought it would be fun to share my discoveries so you all can skip the trial and error part and just buy the good stuff. I want to preface this with, natural deodorant is not for everyone. It is definitely a lighter product and won’t block your sweat glands as that is the job of the aluminum in a standard antiperspirant, and these natural choices don't include that ingredient. You may tend to feel wetter in your pits after a work out or a brisk walk, maybe more so than you would have had you used one of the non-natural options. Another thing to remember is that many regular (non-natural) deodorants are anti-bacterial, this is what makes you smell nice and pretty all day long as that lovely BO smell is the combination of sweat mixing with the bacteria on your skin, deodorants anti-bacterial qualities deter this from happening. Now, a few natural deodorants really do a bad job at keeping the smelliness at bay. But to my surprise, most actually keep up with their non-natural counterparts really well, even without anti-bacterial ingredients. I have to say by the end of some really strenuous days I may have noticed a very faint smell to the armpit region, but nothing overwhelming and never enough for anyone else to detect. The essential oil in many natural deodorants do a fantastic job of masking any unwarranted scent that you may produce throughout the day that may otherwise send your friends running in the opposite direction when you enter the room. I love the smell of natural scented products versus the strange, fake, chemically scents of non-natural ones. I think they smell almost perfume-y and I find that the scent is much lighter but lasts much longer, this paired with how light they feel on my skin is the reasons why I love natural deodorant and won't be switching back to the traditional stuff, even when I'm all done breastfeeding! With most people, the longer you use a natural deodorant the more your body will become accustomed to the product. I have friends who’ve experienced rashes or unusually strong armpit odor upon the initial switch from regular deodorant to natural. Often this goes away once the “detox” period has ended. This is the first week or so (it can even last up to a month) after switching to a natural product, you may be so smelly that you have doubts. I promise your body will start to regulate as you get used to the natural product and your body gets rid of all of the chemicals left behind from your old deodorant. Make sure you’re cleansing regularly, drinking lots of water and even taking hot baths to help open up your pores. Detoxing from deodorant is totally a real thing! Stick it out for the 4 weeks and it will get better, you just need to give your body time to adjust. So far I'm loving the coconut Kopari deodorant! The scent is divine, the perfect mix of subtle coconut and vanilla. Although I don't have sensitive skin some deodorants tend to give me a rash or break my out when I use them. This didn't happen with the Kopari one. I'm super impressed so far, and I feel like the price is fair for what you get! [I have noticed that deodorants with coconut oil tend to be the best for sensitive skin or skin that is prone to breakouts from natural deodorants]. Another plus from this deodorant is that is goes on super smooth, and the formula is clear, I have noticed ZERO transfer on clothing, even before the product has dried. In my opinion this deodorant is a must try! I recently tried a three set gift-box so I could test out a few scents of this brand's deodorants. I've heard so much about LaVanila since they hit Sephora and became super popular! Honestly, I was not super impressed. The product was effective from a deodorant standpoint, it worked as well as any other deodorant. I did notice white transfer on my clothing, even after letting the product dry before putting my clothes on. The product dries out in the packaging, even if it is closed tightly, if you stop using it for more than a couple days. Also, the scent is definitely not my favorite. I did like the blackberry vanilla best, but the other two ("pure vanilla," and "vanilla coconut") we're not at all what I wanted to smell like. I almost couldn't even stand the smell. I find this interesting as I know many people who've tried and love the vanilla scent (I think this was their OG scent). Not only did I dislike the scent, I noticed that the next day the product has broken out the area that I had applied it to, kind of like a rash. No good. I did try it out a few more times just to make sure it wasn't for me, and I can say for sure that La Vanila was not for me. The scent is amazing! I can't remember where I heard about Schmidt's deodorant, it may have been another bloggers Instagram stories or something of the sort. But I'm glad I discovered them! They are also a Portland company and I love to support local companies! The scent has totally staying power, it lasted all day, and I loved that it smelled more like a perfume than that weird deodorant smell. 5 stars for that! The white transfer is minimal to none as long as you let the product dry before you put your clothes on. UPDATE: after using this for an extended period, I have noticed that white transfer has been a little bit of an issue, nothing too crazy, but more than I would prefer. I did notice that the rose scent left a slight discoloration on clothing as the stick seems to have some added color (it is a light brown color) the geranium scent is definitely my favorite from the brand for sure! It had been a while since I tried out the Jason brand deodorant, and after testing it out again for this blog post, I can remember why I hadn't repurchased it. The formulation is way too wet. I don't have 5 minutes to wait for my deodorant to dry before I get dressed. The lavender scent is nice, it smells like essential oils, not artificial at all, but it doesn't last very long and it almost seems as though the deodorant is completely non-effective. Overall, not my favorite, too wet and doesn't work well. I do love the scent, just wish it lasted longer. I hope this post helped to answer any questions you may have had about these three natural deodorants! If there is another type of deodorant you’d like me to review, leave it in the comments below! I love trying out new products.